In spite of all the pre-planning in the world, my usual baking endeavours still entail some degree of dilly-dallying beforehand. Well, not this time. I was standing in the kitchen, and knew I wanted a tart. 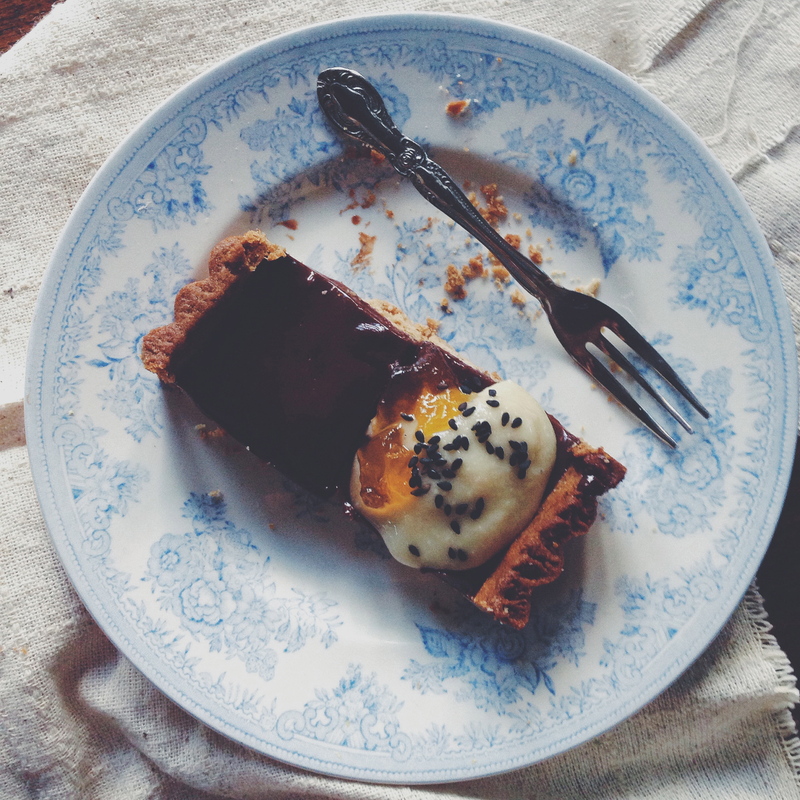 A good tart with a finely baked crisp crust, and some sort of fudgy, gooey middle. Something with depth and exuberance and sin all round. Put simply: I’ve been sooo into dates recently. Nothing really beats a huge, gooey medjool date. Peel one open and you get an untidy split down the middle, unveiling a thin seed and bountiful, sweet, sticky flesh. Yum. So… Date, custard, pistachios? A combination you would perhaps find in a specialty baking store, and a combination I almost haphazardly threw together. A combination that works. Little Maddie was all too keen on having her nose pressed up against the side of the tart shell. I look at her differently now, especially after finishing Eating Animals by Foer. I personally hold many strong views on meat-eating now, but that’s a whole other story that deserves its own section or post. The crust itself is made of just a few things, and is completely eggless– roasted pistachios, flour, butter, sugar and salt. Et Voila. All you really need is a food processor, otherwise you could really just buy ground pistachios and mix the rest in by hand. And the custard? Another story of ease. Dates smushed in the middle of a dense custard, offering perfect contrast to the hard exterior. The crust is buttery and flaky, holding little resistance to any give, thanks to the lack of eggs. What I like is that you can eat this tart alone hot or cold, or with ice cream/ cold whipped cream. I had a thin slice straight out the oven with a scoop of plain vanilla ice cream, which was absolute heaven. The next day, I tried it cold as I put the remains in the fridge, and that was equally sublime. The custard was more set, but if you prefer it a little more warm and watery, all you have to do is microwave it for a couple of minutes. In a food processor, grind your pistachios until you get a coarse meal. Chuck in the flour, sugar and salt, and pulse until everything is well incorporated. Tip the mixture into a large bowl and whisk (or mix with a wooden spoon) everything, making sure the pistachio meal is evenly distributed in the dry mix. Add the softened butter, get your hands in and mix everything together. This shouldn’t take too long. The dough will be easy to break apart, yet dense and moist. Put the bowl containing the dough into the fridge for 20 minutes. Preheat your oven to 180C (350F). After 20 minutes, take the dough out and ready your tart tins. Greasing isn’t necessary because all the butter in the dough does just the job, but if your tart molds are old and not very trustworthy, then go ahead and give them a light greasing. Break your dough in half (or store half in the freezer if you’re just making one tart) and press into your tart mold, making sure to have a thick enough layer on the bottom and sides. Bake the tart for 15 minutes. While the crust is baking, make the filling. Whisk together the egg yolks and sugar for 5 minutes straight, or until visibly light, runny and fluffy. Whisk in the cream, yoghurt and vanilla. Once the tart crust is half-baked, remove from the oven and press in you (de-seeded) dates as shown in the picture above. The heat of the oven will soften them even more, making the insides even gooier, if such a word could exist. Pour the custard on your tart(s), then put back carefully in the oven and bake for another 10-12 minutes. 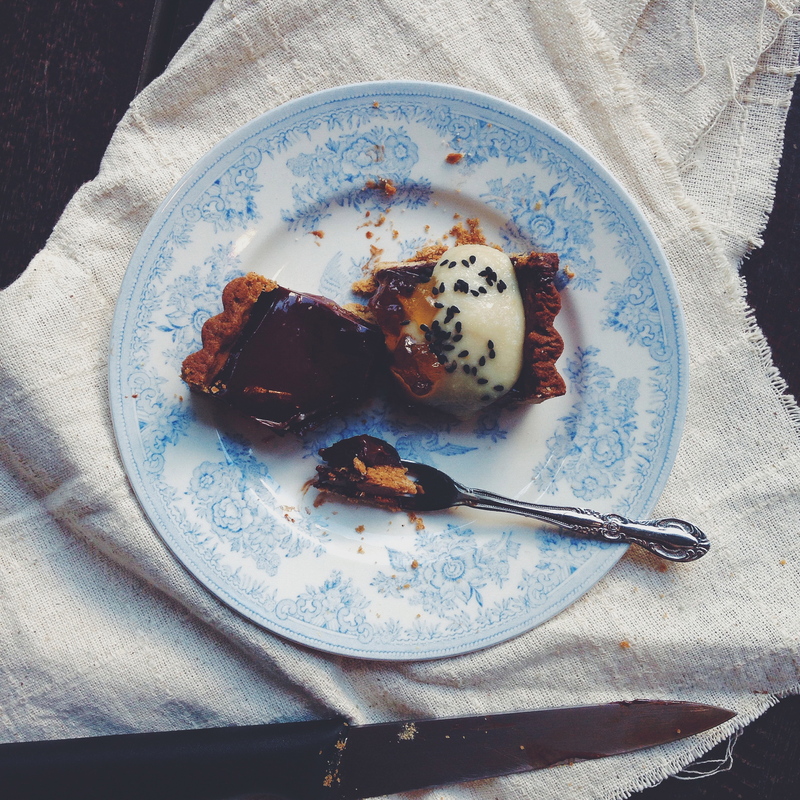 Check the tart at 10 minutes– the top might have some soft brown, caramelised patches. The tart should still hold a little wobble when nudged at the side. Remove from the oven and set on a heatproof mat or stand to let cool for a while before cutting. Eat hot with ice cream, or store in the fridge for a while, before tucking into it cold. There’s little space for mistake(s) when it comes to food pairings made for each other. Rich, dark chocolate filling, chewy bits of nougat, the occasional crunch, smooth caramel. Contemplating the meaning of life earlier on this week whilst scavenging my brain for some coherent essay material, I knew I needed to make something sweet, and good, soon. The brain needs glucose, after all. Magic results lie in the temperature of your butter (cold cold cold, please), and the speediness of all the hand work involved. It all seems a bit of a hassle at first, but I encountered nothing more therapeutic the past week. The movement of my hands in a bowl, rubbing butter into flour and salt and the works is like a welcome slowing down of all the motions you’re forced to go through in life. If you just take an hour out for yourself, make something, have a cup of coffee, or even just think about nothing, everything around you, everything you experience, becomes brighter and more beautiful. I’d hate to sound too much of a yogi because I’m no more the wiser, but the truth only came with experience. Also, you’re probably wondering why there’s one picture in this entire blog post. Now I know as a blogger one is obligated, expected to take a million photos of the entire process, for the reader’s pleasure and benefit. It’s true, I know, but having hall-mates all around means the lifespan of anything baked (especially with chocolate) is circa half an hour, if not just a little less. It was too delicious for too many shots. The waiting had to wait. I’ll leave it at that, and hopefully the next time I won’t disappoint. For the salted caramel: ingredients and procedure may be found here. You will need 80ml (1/3 cup) of the stuff. Prepare pie crust as stated in aforementioned recipe. At the bit where it says ‘preheat the oven and cover with aluminium foil’ preceding the blind bake, don’t! Just bake it normally, then remove once done and let cool, during which time you can prepare the other components. Prepare salted caramel and let cool for a half hour, so it solidifies just a little. In a medium microwave-safe bowl, melt together both types of chocolate, butter and the chocolate bar in 30-second intervals, until everything has nicely melted together. There will be a few sticky bits if you’re using a Snickers bar thanks to the nougat, but that’s what makes it all the more pleasurable. 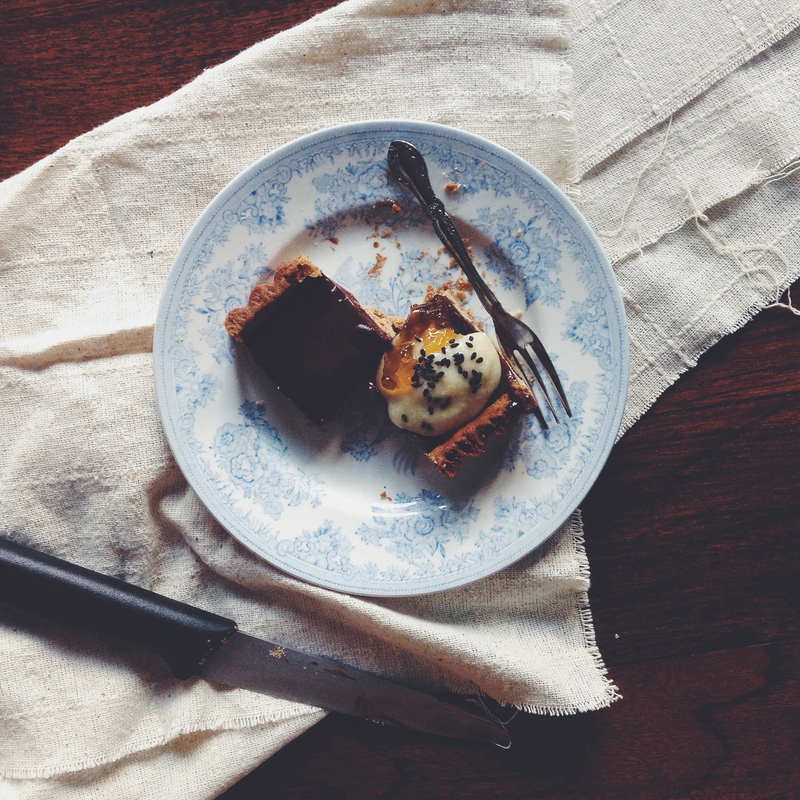 Into the cooled tart crust, pour in the salted caramel and spread into an even layer. Then pour in the chocolate mixture, and sprinkle chopped pecans and peanuts around the edges (optional). This tart need not set in the fridge, but leave to set and stiffen more at room temperature for at least half an hour. Cut using a sharp knife, wiping with a wet towel between each slice. Serve on its own or with whipped cream and more chopped nuts.